TOFU MOM . . . and gravy! : Pumpkins and Vegan Thanksgiving! Yay! I realized a few weeks ago (around Halloween actually) that I've been doing the 100% VEGAN thing for several months now and not even noticing it all that much. In other words, it wasn't as hard as I was thinking it'd be. So with Thanksgiving rolling around, I thought I'd post some of the recipes I think we'll be using this year. Recipes I've used for years and just "veganized" to fit my new style of eating. Since we're big pumpkin/squash fans around here, I thought I'd devote a little space to some of our favorites. (I usually try to grow my own squash - OR liberate a few from the vast acreage my Mom calls a garden.) We do eat things OTHER than pumpkin for Thanksgiving, but I'll save those for another day. 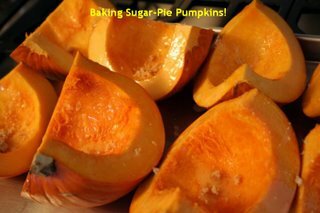 I take the small 'Sugar Pie' pumpkins, quarter them, scoop out strings and seeds and bake at 350 degrees until soft when poked with a fork. After they've cooled, I scoop out of the skin and mash with a potato masher, or for soup or pie, puree with my 'boat motor' immersion blender. If more liquid is needed, I add veggie broth or coconut milk or whatever liquid the recipe calls for. We make this often throughout the fall, not just for Thanksgiving. My kids BEG for it. (Great source of fiber and those "yellow veggie" antioxidants and Vit. A too!) You can spice it up or down, according to how hot you like your curry. Melt margerine in a large saucepan over medium heat. Cook onion 5 minutes, until softened. Add garlic, curry powder, ginger, salt and pepper and cook 1 minute more. Add broth, sugar, water and puree; mix well. Puree soup in blender in batches until smooth. Adjust seasonings - sometimes needs a pinch more sugar, or salt or cayenne - depending on your tastes. 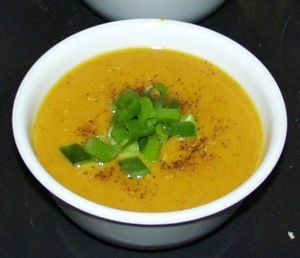 **I cut small sugar pumpkins or Kabocha squash in quarters and bake until soft, then puree with a little vegetable broth for this recipe. 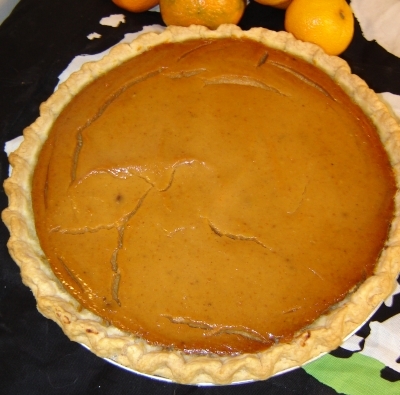 Next up is your classic Thanksgiving Pumpkin Pie (only vegan). I've got to confess, we've tried all those tofu-filled vegan pumpkin pie recipes out there, and while I DO like tofu... a LOT... I don't care for it all that much in a pie. I think you CAN taste the tofu, despite claims from other vegans that it's "exactly the same". So with the help of a half-dozen Internet resources, my daughter and I came up with this non-tofu version and we think it's GREAT. --1/4 tsp. ground allspice or cloves. Pour the filling into the pastry and bake 60 minutes, covering the edges with foil if they begin to brown too quickly. Cool on a rack, then refrigerate overnight before serving. It definitely needs to sit overnight but it will set up firm and the flavors will blend nicely! Cover pumpkin with foil and bake about an hour or until easily pierced with a knife but still firm. In the meantime, bring 2 cups of water to a boil in a saucepan. Stir in the wild rice, reduce to a simmer, then cover and cook until the water is absorbed, about 40 minutes. Heat the oil in a skillet. Add the onion and garlic and sauté until golden. In a mixing bowl, combine the cooked wild rice with the sautéed onion and the remaining ingredients. When the pumpkin or squashes are cool enough to handle, scoop out the pulp, leaving firm shells about 1/2 inch thick. Chop the pulp and stir it into the rice mixture. Taste and adjust seasonings. (I like a LOT of sage and garlic so usually add more). Stuff the pumpkin or squashes, place in foil-lined baking dishes, and cover. Before serving, place in a preheated 350 degree oven. Bake for 15 to 20 minutes, or just until heated through (longer for pumpkin, less for squashes). OK, and my last recipe for our pumpkin adventure - don't freak out ...Pumpkin Lasagna! Seriously, I found the recipe a few weeks ago and thought it looked pretty good. My kids did not, however, so when I made it, it was served to very skeptical faces; But I'm happy to report the older girls loved it (as did I) and it's on our "list" of new Autumn pumpkin favorites! 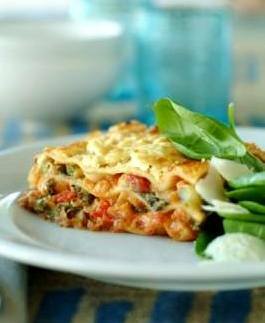 ETA: I just realized I wrote this as I was making/veganizing it the first time, so the ingredients are all out of order, I'll probably come back and edit some time soon, you can probably still figure it out with no problem, I have faith in your cooking skills if you've made it this far!!!. Mix the tomato sauce, soymilk and sugar together. It should look reddish pink. Place a small amount of this sauce in an oiled 9x12 baking pan. Lay 3 pasta sheets in there, take a fourth and break to fill in bottom of pan. Add in the pumpkin, mushrooms, vegan mozzarella, spinach, onions, nutmeg, sage and Italian Spices, nutritional yeast and mix with the "ricotta cheese". Put a layer of this mixture in the pan. Continue to layer sauce, vegetable-pumpkin-"cheese" mixture, noodles, and sauce until all is used up. Top with sauce. Cover with foil and cook about 50 minutes or so. Remove foil, sprinkle with the soy cheese. Bake until cheese melts, (if it does, which vegan cheese doesn't too well...) but about 10 minutes or so. Let stand for about 10-20 minutes and serve. Wickedly rich and SOO yummy! All you need is a salad. (I did a spinach salad with shaved pieces of jicama and it was perfect.) BTW, the lasagna is actually MUCH runnier/gooier than my picture, I confess, I cleaned up the plate to take that pic! Where were you this past Thanksgiving? Right here, but since I just found you I am reading your entire blog. Your pumpkin pie looks wonderful. I make a similar one, but when all is said and done it looks nothing like the omni pumpkin pie. I have to try this recipe. I also make a pumpkin soup and need to try yours. And I think the lasagna looks wonderful and sound tasty. I have seen many people make butternut squash lasagna so why not pumpkin.